It’s taken twenty-eight years to get here, but we are at last publishing our fiftieth Heaven and Earth Catalog! When we looked back at the amount of full time work it takes to produce these, and multiplied it by the number of issues, we realized we have probably been working on catalogs full time for eight of the last twenty-eight years. Whew! We are very excited about the new developments and new stones that are in this issue. A look through the Gemstone Horizons article will show you why we are thrilled about our new stones--really amazing crystals seem to keep popping up as soon as the world is ready for them. This includes something we find truly unique--the Spiralite Gemshells. In them, the world of living organisms and the world of crystals have manifested as one! Speaking of that, did you know that the pineal gland in your brain has a coating of Calcite crystals? Perhaps this has something to do with the powerful resonance may of us feel when we hold other crystals up to our foreheads. And speaking of Calcites and the forehead, check out our collection of new Stellar Beam Calcites. These are truly rare crystals, and they do a lot to vibrate our foreheads! Be sure to have a look at Robert Simmons articles on The Azozeo Transformation and the Azeztulite World Labyrinth. Wonderful times and amazing changes appear to be on the way! We are grateful to all of our readers, and know that some of you have been with us long enough to receive all fifty catalogs. Many thanks and many blessings! In the two years time since we discovered the Azozeo Super-Activation process, many changes have occurred! We have utilized the powerful Azozeo Phenacite crystals, with the Azeztulite pyramid and its surrounding energy grid, to bring thousands of Azeztulites, Nirvana Quartz crystals, Auralite 23 stones and Lemurian Light Crystals to quantum upgrades in their vibrational patterns. We have brought these Super-Activated stones into our catalog and website, and to our exhibitions at the world’s largest mineral show in Tucson, Arizona. Through these actions, thousands of people have resonated with the new Azozeo energies, and many have experienced the initiation of their paths of vibrational ascension. We view all of this as being integral to the vibrational ascension of the Earth, and the co-creative role of humanity within that process. We are committed to that process, and to fulfilling what we discover to be our role in assisting it. Robert Simmons writes: “The evolutionary process which has been designated by the word ‘ascension’ or the term I prefer, ‘vibrational ascension,’ has its roots in the deep memory of the human species. Most of the major cultures of the world hold within their mythologies and stories of their origin a legend of the Fall from Paradise, expulsion from the Garden of Eden, etc. Each of these describes in archetypal terms the loss of a state of being in which humanity was in touch with the Divine, as a natural experience. When some terrible event precipitated the loss of this Divine awareness, people were no longer in conscious communion with the high spiritual realms. No one knows exactly what brought about this change, though many of the myths point to natural catastrophes or calamities brought on by human error. The tale of the destruction of Atlantis is one such story, and it, too, tells of people who enjoyed a higher state of awareness and a greater measure of autonomous power than existed after their disastrous descent. “Many legends of the Great Descent are accompanied by prophecies of the possibility of regaining Paradise. The ascension back to the past state of conscious communion with the Divine, or even a higher state than any previously known, are foretold in these narratives, which resonate with us because we all feel a longing for that connection. The story of the resurrection of Jesus and his Ascension to Heaven, as well as the promise that we all have the opportunity to make the same ascent, speak to this longing. Whether the stories we have inherited are literally true or not, they speak accurately of the longing of human beings for ‘ascension’ to a higher state, which we intuitively sense is possible. This ascension is not a literal rising into the sky, as some myths tell us, but a felt sense of being ‘above’ the uncertainties and difficulties of everyday consciousness and the limitations of ordinary mortal life. “Like many who involve themselves in spiritual pursuits, I have experienced temporary connections with higher states, and have felt what I sensed as the touch of the Divine. Like others who have ‘been there,’ I aspire to a continuous expansion of awareness and full communion with the higher realms. My work with stones is rooted in the intuition that the energies we experience when we are open to the Stone Beings are connections to the Divine realms. I view the crystals as the physical aspect of angelic beings who are helping us achieve Vibrational Ascension by guiding us into higher states. Their energies basically ARE those higher states, when we fully connect with them. In that connection, we BECOME those energies, while still retaining our sense of self. “The entry of Azeztulite into my work over twenty years ago was and continues to be a great blessing. Through the emanations of these stones, I and many others have been able to experience higher states, whenever we put our full attention on connecting with them. Azeztulites are literally ‘stepping stones’ into Vibrational Ascension, helping us to cross the space between what we are and what we can become. The fact that I was led to synchronistically discover a link between the Azez (the angelic activators of Azeztulite) and the angelic allies described in the ancient Gnostic ascension manual called The Books of Ieou, tells me that the project of humanity’s Ascension has been in the works for thousands of years, with the help of some of the SAME angelic beings! Now it appears that the promised union of Heaven and Earth is underway, and the Divine realms are reaching out to us through the very stones of the Earth. And at the same time, our choice, our agreement to participate in this process, is essential for its fulfillment, and for the Earth herself to be able to ascend, becoming the prophesied Paradise of our ancient myths. “Two years ago, I was musing on all of this, and feeling that the peril of our age is so great that there might not be time left for us to make a gently and gradual transformation. I wondered whether the Azeztulites as we knew them (wonderful as they were) were powerful enough to help enough of us transform quickly enough for Vibrational Ascension to occur in time. I wondered if something might be done to bring in a higher and more powerful energy that would have a faster and more lasting effect. I have written elsewhere of the surprising ‘download’ that led me to set up the Azozeo Phenacites within the Azeztulite labyrinth, under the Azeztulite pyramid. The fact that this tangibly WORKED is still amazing to me, but at this point I am fully convinced that the Azozeo Super-Activated Azeztulites (and other Azozeo crystals) emanate much stronger currents of much higher vibration. I have seen and felt the results in myself and many others. “Because of all this, my wife Kathy, our business manager Leo, and I have decided to undertake the Super-Activation of ALL of our Azeztulites, Auralite 23 crystals, Nirvana Quartz and Lemurian Light crystals. This is a big job, because of the size of our inventory and the fact that only a small amount of stones can undergo the process at a given time. We have only one pair of Azozeo Phenacites capable of catalyzing the Super-Activation of more than a few stones at a time, and each batch takes time to receive the quantum energetic upgrade, or vibrational shift. However, having seen how the Azozeo Super-Activated stones affect ourselves and others, and because we view this development as an invitation to contribute to the co-creation of the world’s Vibrational Ascension, it feels like an essential step. We know that countless others (human and angelic, organic and mineral) are working in a myriad of ways to help actualize this, the great longing of our shared existence, and we are grateful to be a part of this process. Robert Simmons writes: “Many readers are already aware that Kathy and I have moved to New Zealand, where we spend most of the year. 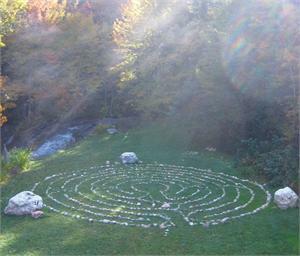 When we moved, there was much discussion of what to do with the labyrinth that had been set up at our house in Vermont. This is the labyrinth within which we first encountered the Azozeo affect, and where we brought many stones for the Super-Activation process. Through months of exposure to the very high vibrations generated there, all of the labyrinth stones became very strongly saturated with these energies. Ultimately we were inspired by the idea of releasing the stones into the world, for the purpose of spreading the Azozeo currents throughout the Earth. This is how the concept of the Azeztulite World Labyrinth was conceived. We decided that it was important to make it as easy as possible for people to acquire these stones, so we reduced the prices far below our usual rates for Azeztulite (and Rosophia, which was also part of the labyrinth). “Since the beginning of this project, hundreds of people have claimed Azozeo Azeztulite World Labyrinth stones, and are working with them for the Vibrational Ascension of themselves and the Earth. Some have felt drawn to choose several, or even a dozen of the stones. We still have many more stones to distribute, and we have now broken some up into smaller, less costly sizes. “We have been delighted to see the labyrinth Azeztulites and Rosophia stones go all over the world, just as we had envisioned. To date, they have been claimed by people from, the USA, Great Britain, Australia, South Africa, New Zealand, Canada, France, Norway, United Arab Emirates, Japan, Holland and other countries. They have been kept in people’s healing spaces and used to work with clients. They have provided energetic assistance to meditators in their personal work. They have been planted at sacred sites, and in secret places where their keepers were drawn to put them for the benefit of the Earth. They are being used by many to activate the Quartz within the ground beneath them, and some people have used them to heal places which have been polluted. In Japan, some of the labyrinth stones were left in areas made radioactive by the Fukushima disaster, while others were given as offerings to repair the lingering wounds in the Earth and the human psyche at Hiroshima. All of these utilizations of the stones are being made with the intention of worldwide healing and upliftment, and they are truly contributing to the making of a World Labyrinth. I am personally grateful to everyone who has been moved to join in this work, and trust that in following our own inner promptings, we will perform the actions most beneficial to all. PS: If you already have one or more of the World Labyrinth stones, or if you acquire one, we’d like to hear from you! What have you been drawn to do with it, what have you experienced energetically, what are your visions about what is going on with all of this? We’ll share some of your stories on our website! We have always loved Selenite, and we offer a wide variety of raw and polished Selenite items. But our favorite Selenite through all the years has been the fabled Naica Selenites. 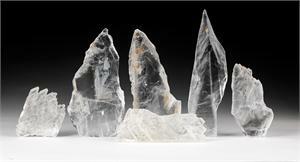 These Selenite crystals come in a variety of forms, including wands, fish-tail, elestial, tetrahedral and tabular. What they have in common is their link with the huge Selenites in the Cave of Giants, which is part of the Naica Selenite discovery. On our buying trip last February, we acquired a fabulous collection of old Naica Selenite crystals. These come on a variety of dramatic shapes and sizes, offering something for just about everyone’s taste and budget. 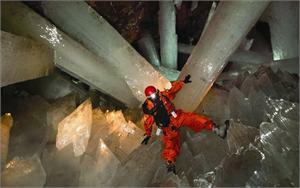 The spectacular Giant Crystal Cave is connected to the Naica Mine, located in Chihuahua, Mexico. 300 meters bellow the surface. Its main chamber contains the largest Selenite crystals ever found, some of them reaching eleven meters in length, four meters in diameter and about fifty-five tons in weight. The conditions here are extreme, with a constant temperature of 136 degrees Fahrenheit and high humidity, proving to be a dangerous environment for those who are exposed more than ten minutes without proper equipment. The crystals are said to be 500,000 years old and were formed from the underground magma (situated below the cave) which maintained the water at a stable temperature of 122 degrees, saturating it with minerals, including gypsum. This process allowed the Selenite crystals to grow to the unbelievable sizes that we see today. The Naica Selenites we have are from other chambers linked to the Cave of Giants. All of them resonate with the powerful energies of the great Selenite Giants that have grown up around and beneath them. Robert Simmons writes: “Selenite quickly opens and activates the third eye, crown chakra, and the Soul Star chakra above the head. The intensity of energy delivered by Selenite is greater than almost any other stone for the upper chakras. A Selenite wand pointed at the third eye sends energy that can feel like a gust of wind going through the forehead and out the top of the head. Selenite is fast and effective at cleansing the auric field, and it can clear congested energies or negativity from one’s physical and etheric body. Crystal healers are recommended to work with Selenite wands, which are ideal for purification and all types of energetic cleansing. When one attaches other stones to Selenite wands, their energies are magnified many times. When one combines several stones and attaches them to a Selenite wand, the energies of the group are blended and amplified, emanating from the wand as a harmonious whole. “Selenite can lift one’s awareness to higher planes of inner experience, making it possible for one to consciously meet one’s spirit guides and guardian angels. It facilitates the experience of receiving advice and information from one’s guides in the form of ‘interior movies.’ In such experiences, one closes one’s eyes in meditation while lying with a Selenite wand resting on the heart chakra and pointing toward the head. If possible, another Selenite wand should be placed on the floor or a pillow, with the point just touching the crown chakra. As one moves into the meditative state, one is likely to see one or more guides, often in forms that symbolize something about the message. The guide or guides will take one through a ‘story’ that reveals the message symbolically. Words are seldom used, which makes the guides’ job much easier. One might say that when Selenite opens the inner eye, the spiritual world enters. “Placing a Selenite wand upon one’s back, along the length of the spine, one can achieve an energetic alignment of the vertebrae and the chakras as well. “Selenite is an excellent stone for building energy grids in one’s home or outdoors. A group of six or more wands of at least eight inches can be arranged to create a miniature energy vortex, which can be disassembled or reassembled as one wishes. Lying down in the center of such a grid can bring about experiences of spiritual ascension. A recent discovery in India has brought for some astonishing new stones. These pieces cross the boundary between fossils and crystals, between organic life and crystal life. In Sanskrit, they are known as Dakshinavarti (left hand coiling) stone shells, and are associated with the Hindu god, Vishnu, the Great Preserver. This association is quite appropriate, for as we shall see, the energetic properties of these stones have much to do with the preservation of life. 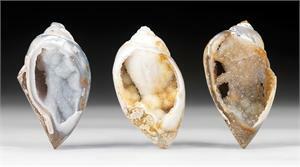 The name we have coined for these marvelously formed specimens is Spiralite Gemshells. This describes two of their main characteristics--their formation through the petrification of ancient spiral form sea shells and their new incarnation as high quality Agate and Druzy crystals. These new stones are truly gems, much rarer and more beautiful than many other gemstone materials. Robert Simmons writes: “When I held a pair of these shining and sparkling shell-shaped stones, I immediately noticed a rhythmic pulsing in the third eye and crown chakras. Yet this was a different pulsation than is usual with other stones, because it formed a definite SPIRAL of energy, coursing through the third eye and crown chakras, focusing on the very center of the brain! The sensation was quite pleasant, shifting consciousness into a state of pleasurable receptivity and widened awareness. After a time, I could sense the energies flowing out of my head, down to the torso and throughout my body. I especially noticed the spiraling currents in my arms and legs, filling them with vitality and life force. I felt that this vibrational infusion was increasing my strength and harmonizing my energies on a cellular level. No wonder the stones were associated with Vishnu, the sustainer of life! “As I attuned to the qualities of these stones, I received the following information: Spiralite Gemshells combine organic life with crystalline life. They bridge the boundary between the animal and mineral worlds, making it much easier for human beings to access crystal energies. These stone shells carry the memory of life in the Earth’s ancient times, and they can be highly refreshing to the etheric body, providing healing benefits to one’s whole being, from spirit and soul to body and cells. “Spiralite Gemshells carry the energies of the Great Spiral, one of the fundamental forms of existence. From the mathematical spirals of fractal geometry, to the physical swirls of ferns and mollusks, from the Spiral Dance of ancient cultures to the spiral galaxies that populate the Universe, this pattern is fundamental and sacred. To work with the Spiralite Gemshells is to bring this pattern powerfully into one’s vibrational field, and to invoke its eternal sacred energies. “Spiralite Gemshells bring one’s consciousness into a powerful focus, increasing access to spiritual information from higher levels of reality. They are excellent stones for channelers, healers and intuitives of all sorts--from medical seers to prophetic visionaries. “These stones aid one in accessing the Akashic Records, in recalling past lives, and in communicating with spiritual beings. They are also powerful aids to developing empathic and telepathic communication with Beings of the Sea, such as whales, dolphins, and even fish! “The infusion of Life Force engendered by Spiralite Gemshells can be beneficial to those recovering their vitality after an injury or illness. It can also lend added stamina to the performance of athletes, through its energizing effect on the etheric body. It enhances one’s psychic capacities, especially in regard to rapport with other living creatures. “On the highest level Spiralite Gemshells support the preservation of life. They are powerful stones of longevity, and can “teach” the spiritual aspect of one’s DNA to evolve itself while retaining its essential stability. They resonate well with DNA, perhaps because both are crystalline spirals. With prolonged use, I sense that Spiralite Gemshells can be used to unlock dormant spiritual potentials frozen in nonactivated parts of our genetic code. They are truly stones of self-actuated evolution, on the spiritual, etheric and physical levels. On our Tucson buying trip last February, we came upon an old collection of Amethyst Flowers from Brazil. These rare formations are called Flowers because of the delicate and complex arrangements of the crystal patterns within them, which often mimic actual flowers. On another level, the beauty of these clusters, and the sweetness of their energies, is another reason for their name. Robert Simmons writes: “When I first saw this amazing collection, I was amazed at the variety and high quality of the entire array. Obviously, someone had spent a lot of time choosing and putting together this lovely array. Crystalline flowers of Amethyst or Clear Quartz are rare, and I had never before seen so many good ones at one time. So, of course, I could not resist getting the collection! “In attuning to the energies of the Amethyst and Quartz Crystal Flowers, I was amazed at how powerfully they resonated in the heart and the brain. Their energies filled the center of my chest with very sweet currents that brought serenity and a feeling of being emotionally uplifted. There was a sense of quiet joy, spreading like a liquid through the body. At the same time, the sweet currents in the heart spread upward, filling the inside of my head with high vibrations carrying an emotional tone of love. Next I noticed that the vibrations in the heart and the brain had united into a single resonating field, filling me with love, awe and wonder. I suddenly understood why I had been so powerfully attracted to these unusual crystals! “Amethyst and Quartz Crystal Flowers stimulate one’s Divine Connection, allowing one to open more easily to the ocean of love that is always around us. Working with one of these stones in prayer or meditation, one is lifted into higher states, and is able to experience communication, as well as communion, with one’s angelic guides and teachers. The expanded states to which one can awaken through working with these stones are actually worlds of consciousness inhabited by spiritual beings who are aware of us, love us, and are ready to assist us in becoming more deeply self-aware. “In spiritual self-healing, these Amethyst and Quartz Crystal Flowers are ideal for repairing damage to the emotional body, and to related physical systems. They energetically support the immune system, allowing one to recover lost vitality. They are nourishing to the heart, and soothing to the digestive system. These stones can be quite helpful in relieving stress, because their currents constantly bathe us in love and remind us that we are never alone. For those interested in working with stone body layouts, I recommend the Amethyst and Quartz Crystal Flowers for bringing healing energies to any of the chakras, and to areas where one can sense disharmonious energies. Carrying, or even wearing one of these clusters as a pendant, is an excellent way to keep the currents of love and healing in one’s auric field. “Amethyst and Quartz Crystal Flowers are also recommended for enhancing the atmospheric energies of one’s home, office or healing room The emanate good vibrations so strongly that they can make a noticeable difference in the way an entire room feels. 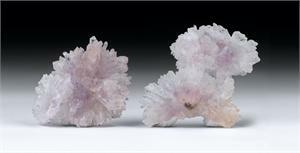 “Both the Clear/White Quartz and Amethyst flowers carry all of the energies described above. The best way to choose is to feel inwardly which piece or pieces one is intuitively most drawn to. This is a method that works every time! 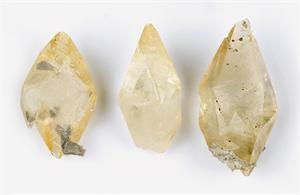 On our February 2014 buying trip, we came upon a small collection of Brazilian Quartz crystal points with some very unusual inclusions. The inclusions looked rather like shiny gray glitter, speckled randomly through the interiors of these glossy clear-to-smoky Quartz points. We learned that the glittery grey inclusions are Hematite, and we were intrigued, because we had never seen anything quite like these crystals before. When we felt their energy currents, we knew they were the right stones for us and our readers! Robert Simmons writes: “When I first held one of these interesting-looking crystals to my forehead, I felt an immediate current move into my third eye. A few seconds later, I noticed a buzzing sensation in my first (base) chakra. That was unusual, because most stones tend to resonate in one general area rather than at opposite ends of the spectrum. Then I realized that it made perfect sense, because high vibration Quartz often resonates at the third eye, while Hematite is frequently associated with the first chakra, and is typically used for grounding. With these crystals, I could more or less keep ‘my head in the clouds and my feet on the ground.’ I wondered whether I could direct the energies up or down the chakra column, and to my delighted surprise, I found that I could, quite easily! Within just a few moments I learned to move the buzzing crystal currents up or down the whole length of my spine. Associate with that movement was a feeling of stimulation, cleansing and balancing, and an interior vision of Light traveling up and down the chakras. “When I attuned to the crystals and asked more deeply about their nature, I heard the phrase, ‘We are Manifest Light.’ That made me smile, because I remembered that, in the Crystal Ally Cards, my Book of Stones co-author Naisha Ahsian’s key phrase for Hematite was Manifest Light. I had not really understood that meaning in regard to Hematite alone, but, with these crystals, it was suddenly obvious. The experience I was having within my body was one of Light manifesting! The currents in my spine were some form of Kundalini energies, and the crystals were helping me to see, feel and direct them! After deciding that I would accept the suggestion to name them Manifest Light Crystals, I meditated more deeply to discover more about their qualities. “Manifest Light Crystals are ideal for initiating Light Body activation, and keeping the Light Body anchored and integrated with the physical body. Their capacity for triggering a safe and subtle activation of Kundalini energies means that they are ideal for initiating new levels of spiritual growth, and for enhancing one’s health and well being by bathing the interior of the physical body with pure spiritual Light. The versatility of energetic expression of which these stones are capable means that they can help to ground those whose upper chakras are over-active, or they can stimulate those whose energy systems are sluggish. They can open the crown chakra and allow one to ascend in awareness to the Angelic realms, or they can help one learn to burrow one’s root chakra down to the core of the Earth. “Manifest Light Crystals have the potential for uniting and reconciling all types of polarities, and they are ideal stones for use in Polarity therapy. Holding one of these in each hand while receiving almost any sort of body work (or simply when meditating) can bring about a profound balancing and integrating of the entire meridian system. These stones carry and emanate a great deal of chi, or Life Force. Thus, they are good stones for those who do martial arts such as chi gung, in which one endeavors to accumulate high levels of chi. “Manifest Light Crystals, as their name implies, are excellent catalysts for manifestation of anything one wishes to bring forth. One has only to ‘program’ the crystal with a visual image of one’s intention, and then hold the stone again while repeating the visualization. Doing this multiple time a day is ideal for a quicker result. Bringing in the emotions of pleasure and gratitude while doing the visualization enhances the effect, and is pleasing to the Being of which these stones are an expression. Among the most enjoyable and colorful surprises of our most recent buying trip was our discovery of Rainbow Garnet. The lovely tumbled pieces we were able to acquire range in color from a rich red-pink to numerous shades of green. Many of the stones are bicolored, with varying mixtures of reddish pink, blending into green. Once they got our attention, we couldn’t put them down, so we brought them back with us! “Robert Simmons writes: “I cannot recall ever having met a happier stone than Rainbow Garnet. These gleaming pieces of multi-hued red and green Garnet practically glow with felicity. They make one want to hold them, and when one does so, the infectious exuberance of their energy moves right into one’s consciousness. I can’t hold one of these stones without a smile creeping across my face. “Rainbow Garnets are great fun to have around. They stimulate one’s innate sense of playfulness, and can be deeply healing to one’s Inner Child. They can also bring important emotional healing to one’s adult side, lightening the load of stress, dispelling one’s attachment to worries, fears, angers and sorrows. They are stones of good humor, and can bring out surprising wittiness, as well as kindness, generosity and cordiality. “If one is hosting a dinner party, it’s a good idea to have a Rainbow Garnet in one’s pocket. The shift in one’s mood facilitated can make one into a better host, and better able to truly enjoy the company of one’s guests. Any time one is meeting new people. A Rainbow Garnet can stimulate a more enjoyable encounter. And needless to say, these stones make excellent gifts, since there is few greater gifts than the experience of happiness. “Rainbow Garnets help one to see the bright side of difficult situations, allowing one to recognize that all things ultimately work toward the good. They are very nourishing to the heart--emotionally and physically--because they promote a state of lightheartedness. These stones resonate to the vibration of joy, and they can help one learn to adopt joy as one’s habitual mode of being. They add zest to life, and are excellent everyday pocket companions. A great surprise on our buying trip was the opportunity to purchase a few dozen rare small crystals of Stellar Beam Calcite. These stones have been unavailable for over ten years, and we jumped at the chance to acquire these. They are among the loveliest small specimens we have ever had, exhibiting shiny surfaces, golden color and a good degree of transparency. Robert Simmons writes: “Stellar Beam Calcites are among the most interdimensional Calcites. They are powerful for stimulating the third eye and crown chakras, and they align those chakras with the higher etheric body, making possible an ‘ascension’ into higher realms of consciousness. They stimulate remembrance of the individual’s experiences in the pre-birth state of full immersion in Spirit, and they assist in the recollection of past lives. Stellar Beam Calcites also carry the vibrational frequencies associated with extraterrestrial intelligences, and they can help one establish contact with these beings in meditation or dreams, or in the peculiar state of ‘out-of-body wakefulness’ that many et contactees have reported. “In addition, Stellar Beam Calcites can facilitate inner travel through corridors of sacred geometric forms, through which one can gain access to the Hall of the Akashic Records, as well as other non-physical archives of past knowledge and information. Atlantis, Lemuria and ancient Egypt (with its connections to Sirius) are among the civilizations whose spiritual secrets can be found with these tools. Skilled travelers can also attune to the morphic fields of an almost unlimited range of information, especially those existing in the history of the Earth. 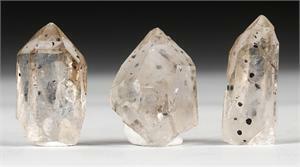 It has been over ten years since we had seen any specimens of rare Eisen Quartz from Morocco. When we found a small collection in the hands of one of our suppliers last February, we quickly snapped it up! These bright orange clusters are unique in both their appearance and their energies. Robert Simmons writes: “Eisen Quartz is a stone of great vitality. Its energy transfers right into one’s field as soon as one picks it up. It carries with it an infusion of vitality, creativity and optimism, encouraging one to confidently embark on whatever creative projects or visions one wishes to bring into reality. It stimulates one’s playfulness and sense of fun--even one’s sense of humor! Comedians (or would-be comedians) ought to carry one of these in their pockets, as the currents of these stones activate the mental pathways that reveal the humorous side of most situations. “Eisen Quartz strongly activates the second chakra, stimulating both creativity and eroticism. An elixir made from Eisen Quartz could be a true love potion. The same elixir, when taken with an intention geared toward creative artistic expression, could fuel inspirations for writers, artists, poets, dancers and others with creative intentions. Eisen Quartz is a stone that can trigger the ‘aha’ moment of sudden insight that brings together disparate ideas into a new synthesis. On our February trip, we were approached by a man carrying something we had never seen--a box full of sparkling Tremolite clusters in a deep violet hue. He told us they had come from a very old collection, and had originally been found in upstate New York. He was not in the mineral business, and just wanted to find the right person who would recognize their value and buy them. After feeling their energies, we were grateful for the opportunity! Robert Simmons writes: “Violet Tremolite is undoubtably one of the rarest and most unusual stones I have encountered. (To the best of my knowledge, the thirty pounds we purchased may be the whole world’s supply!) Like the white and clear Tremolites I have had in the past, they emanate very high vibrations, resonating strongly with the third eye and crown chakras. “When I held the Violet Tremolite in meditation, offering myself into resonant relationship with the Being of this stone, I felt surprising and pleasant currents in my heart area. These moved around inside my body, soon spiraling up my chakra core and into the head. As I asked about the purpose and qualities of Violet Tremolite, images began forming before my inner eye. Before I describe them, I want to provide some information about the properties of Tremolite that have been gleaned from previous experiences. “Tremolite is a powerful crystal that can be used to activate the pineal gland and link it with the surrounding neural circuitry, leading to the opening of the third-eye and crown chakras and conscious access to morphic fields of knowledge. The experience of direct access to knowledge without any learning process has been reported by many mystics through the ages. With this access comes a conviction of knowing, not simply believing. “Uncertainty and the fear that goes with it are a disease of the ego, the small self that most of us unconsciously believe to be our full identity. The ego, being only a part of oneself, can’t know anything—it can only have thoughts and opinions. But when one’s Higher Self blossoms, uncertainty vanishes in the light of knowledge. One has only to wonder about something, and the answer appears in the mind. This is the consciousness of the ‘kingdom of heaven,’ the state in which one merely needs to ‘ask and it shall be given.’ Tremolite vibrates at this frequency, and when one allows oneself to resonate with it, there can be an activation of one’s connection to this level of consciousness. This is particularly with the newfound Violet Tremolite. Sitting with the stone in meditation has produced immediate results in response to inner questions, beginning as visual images, which are commonly the means by which people who tap into morphic fields receive their information. “In my own meditative work with Violet Tremolite, I experienced this very thing! Within minutes of attuning to the stone, I saw an image of blood moving in a spiral pattern through an artery. When I asked what this meant in regard to Violet Tremolite’s beneficial qualities, I immediately inwardly heard the words, ‘negative ionization of the blood.’ I decided to investigate this phrase, and my online research revealed that when negative ions are brought into the body, many beneficial effects occur. They include a happy and energetic mood, stronger metabolic activity, normalization of endocrine activity, decreased stress, and a shift in brain activity to the prefrontal lobes of the brain, where higher conscious processes occur. Several of these effects I could verify myself, because holding the Violet Tremolite had brought on a positive mood, a feeling of calm relaxation, and pleasurable sensations in the front of the brain. Plus, the information about blood ionization was completely new to me, and indicates that the stone did indeed help me tap into the morphic field of knowledge about itself! “In my view, all of the above validates the insight that Tremolite facilitates direct knowing through conscious resonance with invisible fields of knowledge (aka morphic fields). The experience I have just described is only one such event. Tremolites in general, and Violet Tremolite in particular, work vibrationally to help one attune to vast fields of higher consciousness. If one sets one’s intention on opening oneself to the ‘field of all fields’ while working with Violet Tremolite, one may experience the legendary full awakening to Divine awareness. In this experience, one feels and knows oneself to be at one with the whole of all consciousness, while somehow also remaining an individualized self. This experience is always reported to be an ecstatic one, and is the goal of many spiritual paths. “Prior to the mystic opening, or if one does not access all of what Tremolite offers, it facilitates a sense of calm and clarity unlike any other stone. Violet Tremolite is most effective for this, inducing a feeling of serenity and inner clarity. It allows one to easily release stress and anxiety and to face even difficult times with the equanimity that comes from being deeply grounded in Spirit. It can help one to alleviate depression and worry, especially about ‘outer world’ problems like those that one sees on the news. “Tremolite affects the unused neural circuitry of the neocortex, the newest, most complicated parts of the brain. Holding this stone to the third eye, one receives beams of energy which set off pre-existing, but dormant mind centers meant for the next phase of human evolution. When this shift of consciousness is made, many of the seemingly complicated problems of life dissolve, because they simply do not exist for someone at this higher level. It is like waking from a dream—once one is awake, there is no need to go back and untangle the dream situation. “For most people, it will be better to meditate or sleep with Tremolite than to wear it. It is almost too powerful to wear, and one will usually receive the greatest benefit when one is not distracted by a lot of activity. I recommend Tremolite in combination with Phenacite, Azeztulite, Brookite, Danburite, Petalite, and especially Herderite and Beryllonite. Herderite is the other stone keyed specifically to activation of the pattern of evolution to the Divine human blueprint, and Beryllonite helps activate the pituitary gland in resonance with the pineal gland, for spiritual vision and mystic rapture. After years of no new discoveries, some excellent Datolites from Mexico were available to us from a single trader we met on our buying trip. We were fortunate to get a good number of high quality specimens from his stock before other buyers saw it and the whole collection was sold. We paid particular attention to getting crystals of suitable size for metaphysical use. Most are hand-size pieces of one to three inches, all of which are ideal for meditation, body layouts, grids, etc. We also bought from him a number of quite inexpensive small (1 to 1.5 inches) crystals and clusters, with colors a bit less vivid, but with very strong energies! Robert Simmons writes: “Datolites are strong crystals for the third-eye, crown and etheric chakras. They open one’s subtle vision, allowing one to see auras, as well as beings in the astral, causal and subtle domains. Nature spirits, angels, guides, non-physical teachers, healers and helpers all become visible and available for communication. The fast-pulsing energies of Datolite increase the vibration of one’s energy field so one can consciously experience one’s own spiritual body, using it to explore the many higher dimensions surrounding us. “These stones can retrieve lost memories of childhood, past lives, and even the Akashic record of humanity’s ancient history. They can enhance the accuracy of one’s memory and sharpen all mental abilities. They especially aid in developing mathematical intelligence but also improve linguistic learning, memorization, analysis of systems, abstract geometries and other applications of the thinking mind. Datolites are excellent stones for one’s work desk or meditation altar. They will work differently in each case, but the benefits are great. “Yellow-green Datolites (like many in the new collection) in particular can be used to enhance the heart and solar-plexus chakras and their links with the etheric chakras. In order to truly evolve, one must develop the high heart and the high will, the exalted aspects of the fourth and third chakras. Yellow-green Datolite assists in this process, because its vibrational pattern exhibits this exact dynamic in finished form. Being near this type of Datolite, one can develop an energy resonance with it that moves one’s own pattern into this ideal spectrum. True Green Datolites (like some in the new collection) and rare Pink Datolites bring high energy directly into the heart, helping to awaken the heart’s Wisdom consciousness, and initiating true communication between heart and mind. Another stone we have had to do without for some years is Smithsonite. Though once plentiful from the old Magdalena Mine, Smithsonite specimens have become quite rare. We were fortunate to acquire a small collection of them from a trader friend who specializes in materials from Mexico. Each of them is hand-size and ideal for meditation or body layouts. 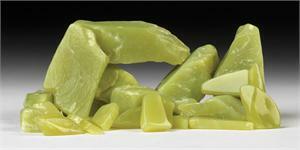 Robert Simmons writes: “Smithsonite is one of the premier stones for soothing the emotional body and relieving stress. It cools anger and resentment, allowing one to reestablish the awareness of Oneness. It unwinds tension and dispels anxiety. It emanates an oceanic feeling of calm and clarity, encouraging one to view difficult situations with fresh, compassionate eyes. It allows one to see Light even in dark times of depression. Carrying or wearing Smithsonite is like having a caring friend by one’s side—so one may be alone, but never lonely. “Smithsonite resonates to the vibration of Kwan Yin, bodhisattva of compassion. Kwan Yin is perhaps the world’s most beloved form of the feminine archetype. People everywhere address themselves to Her for healing and assistance of all kinds. She is said to help with arguments and interpersonal conflicts, legal troubles, and issues of love, as well as healing. Bringing Smithsonite into one’s life helps one build an energetic link with Kwan Yin’s energy. “Smithsonite is a stone of relaxation in all domains. It assists one in entering the state of meditation by calming and relaxing the mind. It facilitates friendship and good feeling in relationships by making each person comfortable with self and others. It promotes relaxation during healing and body layouts by its harmonization of one’s energy field. 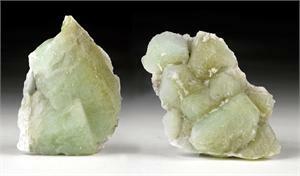 “Smithsonite is a stone for stimulating the psychic sensibilities. It helps one move into the alpha state, in which one is more open to the subtle energies of the nonphysical realms. It can assist one in doing all types of readings for others, and engaging in activities such as remote viewing, psychometry and telepathic communication. In body layout sessions, when both the client and the practitioner hold a piece of Smithsonite, the nonverbal rapport between them is greatly increased, and the spirit guides of both individuals will be able to participate more fully in the session. A few months ago, we were surprised and thrilled to find a batch of old stock of Black Merlinite. This material is a silicated psilomelane found in New Mexico, and has been unavailable for years, except for small amounts in collections. Black Merlinite is characterized by swirling bands of jet black and charcoal gray, and takes a fine, glossy polish. It is among our favorite stones of the Dark Ray. The Merlinite we first encountered over twenty years ago was this same black material, but streaked here and there with white quartz inclusions. Now that we have worked with the purer all-black variety of Merlinite, we like it best. Its energies seem more powerful and focused. Robert Simmons writes: “Merlinite can part the veils between the visible and invisible worlds, opening the doors to deeper intuitive abilities. One of the foremost of these is spirit communication. Meditation with Merlinite can assist one in contacting souls of the deceased who wish to give messages to the living. At first, one’s own loved ones are most likely to come, but as the ability is developed, one may be visited by the departed relatives and friends of others who hope to use one as a means to reach them. If one is comfortable making such connections, great service is possible. “Merlinite is an aid to learning all types of magic. It opens the psychic channels for intuitive understanding and also attracts teachers from other planes to assist in one’s ‘studies’ during the dream state and in meditation. It helps one grasp the interrelations between astrology, tarot, numerology and other ‘occult sciences. It facilitates the practice of scrying, in which one gazes into a mirror, polished stone or other reflective surface in order to view probable futures. (Gazing into a polished slice of pure Black Merlinite is perhaps the most effective way to scry.) Merlinite attracts frequent synchronicities, which demonstrate the absolute coordination through which reality functions simultaneously on all levels. It opens one’s energy field to its innate capacity to serve as a channel for manifestation—the birthing into the physical world of the creative forces of the higher planes. “Merlinite, itself a stone of the Storm element, connects one to all the other elemental forces—Earth, Water, Wind, Fire and Storm—allowing one to call upon them for aid in one’s pursuits and ambitions. Through this connection, one can learn to influence outer elemental processes, perhaps beginning with vaporizing clouds, but potentially moving towards dancing with the weather in other ways, even becoming a ‘rainmaker.’ One is cautioned not to go on a ‘power trip’ in these areas. Such abilities are only a step on the path and must be transcended as one moves higher. “Black Merlinite is a stone of the deep Unconscious, which is the great well of potential from which true creativity springs. It is the realm of dreams, and Black Merlinite is a fantastic stone to aid in achieving the state of lucid dreaming. In addition, it facilitates meditation, allowing one to ‘go deep’ very readily. It offers a direct conduit to the Silence-- the still point at the center of all things. “Merlinite can be a potent catalyst for past-life recall. It evokes the realm of dreams and imagination and makes the recollections of past incarnations much more vivid than they might otherwise be. It activates the ‘inner radar’ that makes certain that one’s past-life experiences are the ones most relevant to one’s current needs for healing and inner growth. True to its name, however, Merlinite has an affinity for past lives in the Arthurian times and will quickly guide one to any one might have had in that realm. “The pure black form of Merlinite is the most powerful, and is useful in facilitating shamanic journeying, spirit communication, divination and prophetic vision. Those wishing to work specifically with prophecy are advised to add Prophecy Stone or Nirvana Quartz to the Black Merlinite. One of the stones we have been asked for the most over the years is Prophecy Stone. These odd concretions from the northern Sahara desert are among the most powerful stones we have encountered. They have a much higher vibration than one might expect by simply looking at them, and they aid in grounding high vibrations in the body and in the Earth. We were lucky to acquire a small collection of old pieces recently. No new Prophecy Stones have been found for over ten years! Robert Simmons writes: “Prophecy Stones are perhaps the most powerful of all minerals for grounding Light energy in the physical body. When one holds or meditates with one of these stones, a great deal of energy comes in through the crown chakra, filling the body, all the way down to the soles of the feet. After a few minutes, the energy moves even deeper, stimulating the Earthstar chakra below the feet and anchoring in the Earth itself. This experience is common to many individuals who work with Prophecy Stone, and many people are amazed at the strength of the vibrations that move through them when they hold these stones. “The unique manner in which Prophecy Stones work, pulling high-frequency energies down into the body from above, echoes the teachings of the spiritual master Sri Aurobindo. Aurobindo taught that one should not seek to transcend the Earth and move up into nirvana, and instead directed his followers to draw the higher energies down into the body, for the transfiguration of human beings into their destined form—Aurobindo called this the ‘superman.’ This revolutionary teacher did not guide his students to arouse the kundalini from the base chakra, but rather to bring ‘the supramental force’ down through the crown chakra into the physical self. Prophecy Stone seems to do just that. “Often, the initial experiences are fragmentary, and one may not be certain of the time frame to which they refer. Here are three sentences I wrote after one of my initial experiences with Prophecy Stone in the mid 1990s: “My meditation placed me in the ‘time of transition,’ not far from now. I was in a very large building in a big city, where people came rushing in and out with much urgency. I had the sense that they were trying to rescue others from some danger or disaster.” At the time, I had no means of placing or verifying this image, though later I came to wonder if I had been seeing the World Trade Center disaster. This was such a powerful psychic event that many people experienced prophetic dreams, visions and intuitions before it happened. I do not doubt that Prophecy Stone can trigger such visions, but one must work to understand the meanings within the prescient messages. One of the most popular stones we’ve discovered in recent years is Sedonalite. Embodying the red rock and high vibrations of the Sedona, Arizona energy vortexes where they are found, they can be quite transformational for those who work with them. Our first Sedonalites were concretions, and we sold out of them. However, this year we were able to acquire a good array of naturally tumbled pure Sedonalites from a different collector. These are at least as powerful as our original pieces, and the are available in a variety of sizes. One can even take a half dozen of the larger ones and make one’s own Sedona vortex, wherever one happens to be! Robert Simmons writes: “Sedonalite is a stone of dynamic energetic balance. It can both charge and harmonize the meridian system, and it can bring one’s astral and subtle bodies into resonant alignment with the physical. The stones are both grounding and stimulating, engendering a heightened sense of sensitivity and alertness. They are like two cups of coffee, in the best sense––recharging the nervous system, enhancing thought and verbalization, but without causing tension or irritability, as caffeine can do. These stones wake you up, but they don’t drag you down! They can be used to activate any of the chakras, as well as the meridians. 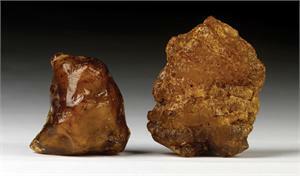 “Sedonalite heightens one’s psychic capacities, enhancing any natural sensitivities and adding dimensions. For example, with Sedonalite, naturally clairvoyant people may also receive auditory messages, and healers may discover a capacity to envision the future. Sedonalite seems able to clear away mental fog, fatigue and dullness, and to jump start one’s enthusiasm. It carries a highly optimistic energy, inspiring one to get going on manifesting one’s dreams. “Sedonalite of course is intimately linked with the environment of Sedona, Arizona, and all the phenomena that occur there. Consequently, it can trigger spontaneous spiritual experiences, including sudden states of samadhi, recall of past lives, visions of spirit beings and ETs, and the awakening of one’s ability to channel the messages of beings in the spiritual planes. It offers a quick acceleration of one’s spiritual growth. In meditation, it can facilitate extraordinary visions. 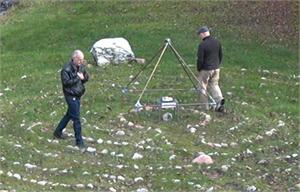 “One can actually create a ‘mini-vortex by arranging a group of Sedonalite stones in a circle. Even better, if one has enough stones, one can make a Medicine Wheel pattern. This mini-vortex can be used to charge the energies of a room or an entire home. Placing another stone, such as a Moldavite or Azeztulite in the center of the circle will put it at the focal point of the magnifying vortex, and one’s whole environment will be filled with that stone’s energies. If you have tried our Azozeo Gem Essence, you have most likely already experienced the amazing intensity of subtle energies carried by the Super-Activated water. Now we have come up with several new Essences that we find equally powerful, yet differing from one another in remarkable and wonderful ways that reflect the stones used in making them. We have always been drawn to working alchemically with stones, and our Gem Essences are pure alchemy! Working with naturally charged and activated crystal water from springs in the heart of the Arkansas Crystal Country, we expose the water to the stones within the powerful energetic environment of the Azozeo Azeztulite pyramid with the Azozeo Phenacites in place. (Just that part of the process makes a big difference energetically!) Then, with ritual, prayer and attunement, we call in the enlightened energies of each Stone Being to infuse the water. This time we worked with combinations of stones, blended together into a single essence. We chose two of the most popular and powerful combinations with which we have worked for many years--the Synergy Twelve stones, and the Ascension Seven. The Synergy Twelve stones are Moldavite, Phenacite, Tanzanite, Danburite, White Azeztulite, Petalite, Herderite, Satyaloka Clear Azeztulite, Natrolite, Tibetan Tektite, Scolecite and Brookite. (Azeztulites are both Azozeo Super-Activated.) These energies combine to enhance one’s entire vibrational pattern, facilitating the emergence of one’s wholeness and power in service of one’s Divine destiny. The Ascension Seven combination includes Phenacite, Herderite, Azozeo Azeztulite, Scolecite, Brookite, Natrolite and Petalite. These are the stones we have worked with for years to facilitate the experience of Vibrational Ascension. The incorporation of Azozeo Super Activated Azeztulite gives this Essence an additional energetic boost! 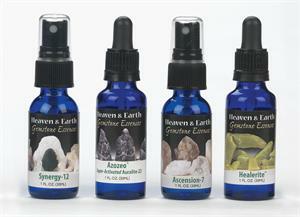 As we continue to develop our line of Gem Essences, we’ll be experimenting with many other combinations. Stay tuned! Note: we do not allow any toxic minerals to touch the water in our essences. If such minerals are used at all, we work with a double-bottle method which keeps the actual stone physically separated from the water, so only its energies connect with it. We urge readers making their own essences to be very careful too! If in any doubt, use a double-bottle method. New Earth Consciousness with Cinnazez, White Azeztulite, Honey and Cream Azeztulite. Prosperity Energy with Cinnazez, Himalaya Gold Azeztulite, Golden Azeztulite. Healing Serenity and Love with Azumar, Healerite, Lithium Light. Joy Awakening with Azumar, White Azeztulite, Satyaloka Clear Azeztulite. Magic of Transformation with Cinnazez, Satyaloka Clear Azeztulite, Mystic Merlinite. Shamanic Power with Auralite-23, Mystic Merlinite, Master Shamanite. We are very pleased to offer these new stone combinations, which have been careful chosen to enhance the specific areas of life suggested by their names. We feel that all of these qualities are essential elements of the 2021 transformation and the fulfillment of Vibrational Ascension. Morganite/Aquamarine: For love, serenity and emotional well being. Kyanite: For psychic ability, past life recall, telepathy and empathy. Citrine: For mental clarity, alertness and the power of manifestation. 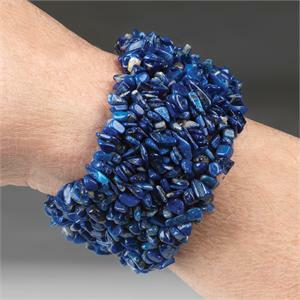 Lapis Lazuli: For inner vision, communication of truth, living with virtue. Clear Quartz/Black Tourmaline: For purity, clarity, protection and grounding. Moonstone: For intuition, receptivity, link with the Goddess, emotional intelligence. Blue-Green Apatite: For intuitive access to knowledge, healthy weight control. Smoky Quartz: For physical well-being, grounding and protection. These bracelets are fun to wear and reasonably priced. We think our readers will love them! Purple Ray: with Amethyst, Sugilite, Amazez, Auralite-23, and Charoite. For spiritual connection, psychic abilities, purification of the aura, awakening the higher Self. Prosperity, Energy and Power: with Cinnazez, Himalaya Gold Azeztulite and Golden Azeztulite. For prosperous abundance on all levels--financial, health, relationships and enjoyment of life. Spiral of Light: with Spiral Gemshell, Azumar, White Azeztulite, Honey & Cream Azeztulite and Satyaloka Clear Azeztulite. For ascending the ladder of consciousness in a state of ecstatic bliss. Black Ray: with Black Merlinite, Black Tourmaline, Shungite, Master Shamanite, Mani Stone, Jet and Mystic Merlinite. For healing, strength, personal power, and the transmutation of all negative energies into positive. Golden Ray: with Satyaloka Yellow Azeztulite, Golden Azeztulite, Himalaya Gold Azeztulite, Agni Gold Danburite, Golden Labradorite and Lemurian Golden Opal. For entering the Golden Light of enlightened consciousness, and for manifesting one’s creative visions through the power of the will. Visionary Experience: with Nuummite, Labradorite, Phenacite, Satyaloka Clear Azeztulite, Natrolite, Auralite-23, White Azeztulite. For interdimensional travel, expansion of awareness, inner visions, enhanced meditative experience, awakening to higher truth. Blue Ray: with Azumar, Larimar, Angelite, Lapis. For clear communication of one’s truth, emotional balance, enhanced insight, joyful self-expression. Shungite Power, Purity and Protection: with Shungite, Guardianite, Auralite-23, Amazez, Cinnazez, Mystic Merlinite, Master Shamanite, Stonehenge Bluestone. For profound access to power, deep inner purification, shielding from all negative energies. White Light of Ecstatic Bliss: with Anandalite, White Azeztulite, Petalite, Satyaloka Clear Azeztulite, Danburite and Scolecite. We are pleased to offer these amazing high-energy strands. We’re sure that those who choose them will be pleasantly amazed at the energies they experience! Once in awhile, we come upon a stone that is in a class by itself. On our buying trip, we were amazed to come across a large natural scepter of Black Hemimorphite. We had never seen Hemimorphite, or any mineral in a shape and size like this. The currents coming from it are strong and very different than any we have encountered. Robert Simmons writes: “Hemimorphite manifests the energy of well-being on many levels. It brings balance to the auric field, dissolving and dispelling dark spots of negativity or weakness. It affects the emotional body in very positive ways, bringing in a vibration of joy which does not deny life’s unavoidable incidents of grief and sorrow. In fact, Hemimorphite’s energy tends to blend joy and sorrow into a single flow of compassionate emotional involvement and empathy, for oneself and others. When one does not resist any emotion, the unimpeded flow of feeling is in itself so rewarding that even grief retains an element of joy. Hemimorphite enables the emotional body to freely interpenetrate the mind and the physical self, so this unimpeded flow is fully established. “This Black Hemimorphite is definitely a tool for healing, and my hope is that a healer will claim it. In the hands of someone willing to work with the stone in a surrendered manner for the purpose of healing self and others, this powerful natural scepter holds great potential. It manifests its power through receptivity, allowing any and all negative energies of the person in need of healing to leave the person and enter the stone. As this occurs, the negative energies are transmuted into love, through the pure yin energy of the stone. “Speaking of yin energies, the Black Hemimorphite Scepter has shown itself to me in an image in which it appears as the healing wand of Kwan Yin, the Bodhisattva of Compassion. I understand this to mean that Kwan Yin is linked to the stone, and that its profound healing vibrations come from her. This is in resonance with Hemimorphite’s overall energy non-resistent joy, and with my felt sense that this is a particularly special healing tool. “The black color of the Scepter speaks of its receptivity. It takes in all vibrations and is able to transmute them appropriately. It is a strongly feminine piece, resonating with the feminine quality of strength. It will contribute to this quality in whoever works with it. It can also enhance one’s intuitive capacities in all areas, including psychic abilities, mediumship, and attunement to higher beings wishing to impart spiritual information to humanity. “All types of Hemimorphite combine synergistically with Smithsonite, Andalusite, Pyrite, Aragonite and the many varieties of Calcite, especially Stellar Beam Calcite. 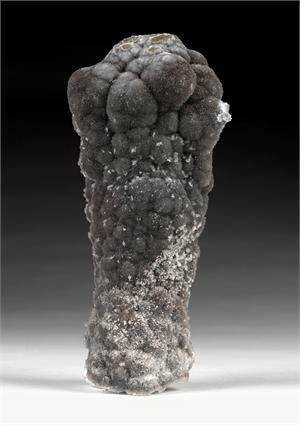 This Black Hemimorphite resonates strongly with Healerite, Seraphinite, Sugilite, Master Shamanite and White Azeztulite. All of these enhance its healing potential. For those using Hemimorphite for channeling or mediumship, combining it with Phenacite, Satyaloka Clear Azeztulite, Natrolite, Scolecite or Herderite is highly recommended. One of the surprise buys we made at the 2014 Tucson Gem Show was a small collection of very nice, and unusually large, Danburite crystals. These are strong, sweet and very uplifting crystals. We only wish we had found a bigger batch of them! Robert Simmons writes: “Anyone who wants to evolve spiritually can benefit from exposure to Danburite. It is a gentle and powerful aid to the upliftment of one’s awareness to the higher spiritual vibrations. Danburite clears and opens the crown chakra, linking and harmonizing it with the heart. It also activates and integrates the transpersonal and etheric chakras above the head, all the way up to the fourteenth chakra. 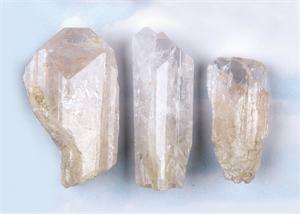 This allows one to move in consciousness into the angelic domain, with which Danburite has a special resonance. It also facilitates interdimensional travel and communication with spiritual entities other than angels. “Danburite is an excellent stone for those who need to release stress and worry. It soothes the heart and sends it the message that all is well. This is often a much-needed signal in the anxiety-filled world of these times. Holding a Danburite in each hand can be a very calming experience and a boon to meditation. Those who have difficulty sleeping are advised to hold a Danburite in the hand or place one in the pillowcase, or both, in order to bring peace to the subconscious self. 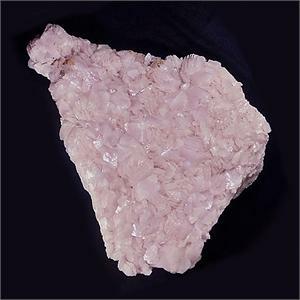 Danburite has a way of calming down the mind chatter that can so easily make an insomniac of anyone who has a busy life. 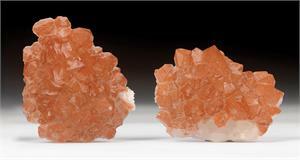 “Almost all the Danburite in circulation comes from Mexico, but there are other varieties of Danburite from different localities, and these have different energetic signatures. Peruvian Danburite crystals are gray, opaque and double-terminated. In addition to the aforementioned properties of Danburite, these stones have a special vibrational affinity with extraterrestrial entities and can assist one in making contact with them on the inner planes. Madagascar Danburites are golden in color, and they are attuned to the sweetness of etheric music. They can help one experience the legendary ‘music of the spheres.’ Russian Danburite appears in crystals which are often slightly smoky, with duller surfaces than Danburites from Mexico. 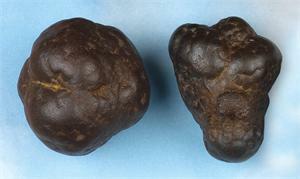 Russian Danburites vibrate with somewhat more intensity than the other varieties, and they are strong activators of the third eye for visionary experience. “Danburite is one of the stones in the Synergy Twelve group, along with Moldavite, Phenacite, Tanzanite, Azeztulite, Herderite, Petalite, Tibetan Tektite, Brookite, Natrolite, Scolecite and Satyaloka Quartz. This combination is the most powerful yet discovered for the harmonic activation of the entire human energy field. For purposes of stress relief and relaxation Danburite harmonizes well with Lilac Lepidolite, Amblygonite and Lithium Quartz. For interdimensional travel, Merkabite Calcite and Elestial Calcite are ideal allies. Smoky Quartz provides a good grounding influence, while Pink Tourmaline and Morganite help strengthen the heart-chakra connection. At our big exhibition in Tucson, we were very pleased to see the enthusiastic reaction with which visitors experienced our Azozeo Super Activated Cinnazez stones, shapes, beads and jewelry. There was no doubt that these are among the highest-energy stones ever come to us. All we can say is: we share your enthusiasm! Robert Simmons writes: “Only a few weeks before the 2013 Tucson show last February, I received in the mail a stone that I had never dreamed existed. It was a vivid mixture of red, white and translucent gray colors, and its currents were astonishingly powerful. It came from a friend in New Zealand, where the stone was discovered in a remote mountainous part of the South Island. I had been aware for over a year that some New Zealand stones carry the currents of Azeztulite, and we had been enthusiastically offering both types found thus far--the beautiful Sauralite Azeztulite crystal clusters and the more recently discovered Honey and Cream Azeztulite. What I never imagined was that there might be a stone that combines the high vibrations of New Zealand Azeztulite with the powerful energies of Cinnabar. The name for the new stone--Cinnazez--seemed to practically shout itself into my inner ears. Once again, the mineral realm has revealed a new stone at precisely the moment when it can be of greatest benefit. “My felt sense, upon first holding a pair of Cinnazez stones, was of a powerful healing and enlightening wave spreading through my body, beginning in the head, and moving quickly throughout the torso and finally all the way to my feet. The speed at which the currents of these stones spread is surprising, and unexpectedly pleasant. It is as though the cells are receiving a powerful wave of life force, love and wisdom--a wave that is simultaneously comforting and illuminating. I found that once I picked up the stones, I did not want to put them down, and that even when I willed myself to set them aside, I picked them up again within a couple of minutes. The attraction to these stones is palpable, at least in my case, and I think it is because there is something in the currents of Cinnazez that satisfies a powerful evolutionary need. “I was fascinated at the alchemical references in these initial insights. I had studied enough alchemy to know that the fabled Philosophers’ Stone (believed to be capable of prolonging life indefinitely and transmuting lead to gold) was said to appear in three stages. The initial dark phase (nigredo) signified unenlightened matter, and could refer to most of the Earth’s dormant rocks, which are spiritually asleep. The second phase, the white phase (albedo), signified a state of spiritually awakened matter, capable of attuning to spiritual Light and awakening the alchemist to his or her higher destiny. I have long believed that the original white Azeztulite represents this aspect of the Philosophers’ Stone. The third and final phase of the development of the Philosopher’s Stone is the red phase (rubedo) in which the Stone has fully developed all of its powers. In its red phase, the Philosopher’s Stone is believed to supply the alchemist with power over his or her own longevity, and the ability to heal others and transmute matter from one state to another. “The similarities of the red phase of the Philosophers’ Stone to the description of the properties of Cinnazez filled me with excitement. Had the most magical and spiritually potent stone of all arrived at last? 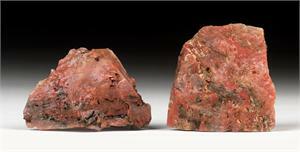 This was, after all, not just another red stone--it was Azeztulite combined with Cinnabar. Azeztulite is the most Light-filled stone I know, and Cinnabar is a compound of Mercury and Sulphur, two of the most important elements in traditional alchemical work. I was eager to delve more deeply into the properties of these remarkable stones. Here are some of them: “Cinnazez is a quickener of evolutionary growth. It stimulates the brain and central nervous system, increasing one’s receptivity to fields of knowledge in the inner realms. It aids those who wish to access the akashic records, or to discover the answers to questions or problems in any area. 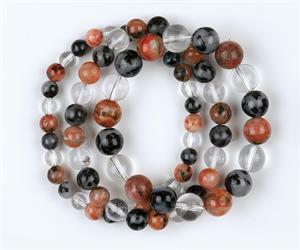 Cinnazez stimulates one’s vibrational field, so that one becomes a better conductor of all kinds of positive energies. It enhances one’s capacity to form and hold inner images, which are often the form in which spiritual ‘downloads’ of Divine knowledge come to us. It makes one more of an ‘attractor’ of new knowledge and insights, in the same way a metal post attracts lightning. “Cinnazez also stimulates the intelligence of the heart, and it strengthens the neural networks via which the mind and heart communicate. It can facilitate the inner experience of hearing the voice of one’s heart, and of recognizing and following the heart’s wisdom. As it awakens heart intelligence to a greater degree of conscious awareness, it opens the channels of angelic and interdimensional communication. It is an ally for those seeking to understand the inner workings of the Universe. “Cinnazez is a powerful stone of inner alchemy, stimulating the Liquid Crystal Body Matrix to a higher level of coherence and energy. The stone’s vibrational waves can be viewed as waves of resonance, bringing all the cells into harmonious alignment. They stimulate the inner experiences of primordial Light and Sound, allowing one to enter into visionary experiences which are both Light-filled and tangibly vibrational, making one’s body into a resonating chamber of Divine Speech. If one aspires to become a spiritual channel or medium, Cinnazez can facilitate rapid advancement on these paths. Those who work with oracles such as Tarot and the I Ching in conjunction with Cinnazez may discover that their insights are enhanced, and their ability to notice hidden meaningful connections is increased. “Wearing or carrying Cinnazez can trigger an increase in synchronicities in one’s life, and a clear awareness of their meaning. These stones tend to engender an alchemical transmutation of oneself from the ‘lead’ of fragmented, ego-driven consciousness to the wholeness and dynamic powerful of one’s Higher Self. To incarnate the Higher Self is to realize true spiritual Gold. Perhaps the stone which received the most ooohs and aaahs at our Tucson exhibition in February was Azumar. People immediately connected with the beautiful color and sweet, blissful energies of these stones. Robert Simmons writes: “When I first touched a piece of Azumar, inviting the Being of the stone to enter into my bodily energy field, I was surprised by its power and delighted by the qualities of its vibrations. The stone emanated strong, rhythmic pulsations at a regular, steady rate--similar to waves coming in from the ocean. These pulses coursed through my entire body, activating the upper chakras first, then flowing down all the way to my feet. The sensation was intensely pleasurable, like being washed internally with joy. After only a few moments, the waves of the stone established a resonance throughout my entire Liquid Crystal Body Matrix, with each pulse pouring downward from head to toes. The reaction of my bodily energies was what I can only call ‘rejoicing.’ It was as if a beloved being who had been long absent had at last returned. Or it might be said that my body energies felt as if they were being tuned, like a violin, to make the most beautiful music they could ever make. There is an unmistakable watery feel to the flow of Azumar’s currents, and that energy transforms the body’s inner ocean to a moving sea of rhythmic bliss. It is as if the liquid within us comes alive with joy and enhanced awareness. “In my meditation with Azumar, I was met by a vision of the Being of this stone. Azumar appeared to me as a female being of great beauty and power. Her hair was blue like the sky and ocean, and her eyes were turquoise colored. Her skin was very smooth and pale, and she wore a gown of shimmering blue-green, with light glinting from it in the same manner that sunlight reflects on the sea. She beckoned for me to follow her into the water, and down to a sea cave. In my vision, we were pulled through the water cave by strong currents, until we reached a cavern filled with phosphorescent turquoise light, and we stepped back onto the land. The light seemed to come from the walls of the cave, and it pulsed in a slow rhythm. There were blue stalactites reaching down from the ceiling, like the pipes of an organ, and there was an altar with a natural stone basin filled with pure clear water. She motioned for me to approach the basin and look into the water. “There were more visions in the basin, in which personal counsel for myself was mingled with more disclosures regarding the qualities of Azumar. I will try to summarize these in my own words. “Azumar is a powerful stone in the realm of feeling. Its currents wash through the Liquid Crystal Body Matrix, bringing refreshment, joy and rejuvenation to every cell. It is a wonderful stone for healing and brightening the emotional body--effortlessly dissolving negative fixations within its peaceful waves of pleasure and power. It can aid in dispelling anger, envy, fear and stress, replacing them with serenity, enthusiasm, confidence and the feeling of being enveloped within an atmosphere of love. As Azumar does its work of transformation within the waters of our liquid crystal structures, dysfunctional patterns dissolve and we are filled with the joy that underlies all life. We are made clear, like a flowing spring, and this clarification of consciousness gives rise to untapped intuitive potentials. We can suddenly begin to develop clairvoyance, telepathic sensitivity, and the capacity for enhanced visionary awareness. Those who are readers of oracles may find their senses heightened and their ability to see future events increased. Those who are channels or mediums will find that their attunement to Spirit is easier and deeper. And all of those who work with Azumar will experience its powerful influx of pleasure, power and joy. Under Azumar’s influence, one’s awareness can rise to the highest possible perspective, while still penetrating to the intimate depths of whatever is the focus of one’s attention. This is one of the most powerful stones I have encountered for personal evolution and the enhancement of consciousness. “Azumar demonstrates that life itself is a flow of ecstasy, and that when one is in tune with the truth of life, one is in a state of rapturous joy. This stone silently asks the question, ‘How much joy will you allow yourself to feel?’ When one meditates with Azumar, one discovers that its surging pulsations always move one toward more profound happiness and more intense pleasure. Like the waters of the ocean, there is no limit to the tides of love and joy flowing through these beautiful stones. “I tried sleeping with an Azumar stone for several nights, and was surprised to find that the intensity of happiness generated by these stones did not diminish, even during sleep. During the nights I slept with Azumar, I was aware of joy in both my body and my dreams. When I awoke during the night, I could feel my body resonating with the stone’s waves of pleasurable energy, and I remembered the happy atmosphere of all my dreams. I have the sense that these stones could be helpful to those experiencing depression or insomnia, or who are bothered by nightmares. Experiencing such happiness in the sleep state was a new phenomenon for me. “Azumar is a stone of insight and communication. It allows one to penetrate to the heart of matters, and it enhances one’s ability to eloquently express one’s deepest truth. It is a stone of compassion, engendering one’s innate capacity to understand and care for others. It is an Earth Spirit stone, allowing one to feel and harmonize with planetary consciousness. As a stone of the Water element, it facilitates empathic communication with sea life, especially the more highly evolved creatures such as whales and dolphins. It can be used by those who are near or on the sea to attract dolphins and whales by centering in one’s heart and calling to them, while asking the Being of Azumar to assist in the communication. “In spiritual self-healing, Azumar is recommended for conditions of the circulatory and nervous systems. The internal bodily resonance it engenders can help to implant the pattern of optimal well being into all bodily systems involving the flow of fluids or electrochemical energies. “In spiritual life, Azumar can aid in attaining the state of ecstatic rapture known as samadhi, as well as karuna, the state of true compassion. The loving qualities of Azumar can aid one in remembering that the true purpose of life is the expression of love and the creation of beauty stemming from that love. It also enhances one’s recognition and appreciation of beauty, so that one more clearly understands and truly feels the essential beauty of the Soul of the World. “Perhaps most importantly, Azumar is a stone attuned to the times we are now experiencing. Since the December 2012 turning point, I have sensed a growing feeling of sweetness in the world, and in the people I encounter. It is subtle and rather mysterious, yet I am running into it again and again. People are tending to be gentler and more loving in their interactions. My feeling is that this is because of an increased conscious presence of the Soul of the World, a more vivid experience of Her, which manifests as this subtle but pervading sweetness. The feminine being called Azumar is one of the faces of the World Soul. As I have written elsewhere, I feel that the time between December 2012 and December 2021 will be experienced as the Nine Years of Blessing, leading to the vibrational Ascension of humanity and the Earth into an ecstatic shared consciousness of co-creative unity with the World Soul. As we move through this time, we will have the opportunity to be a part of this evolution of love. Indeed, without the participation of human beings, the harvest of the Earth’s joy cannot ripen. The delightful energy we feel emanating from Azumar is a taste of this most wonderful potential, which we can help to manifest. We are called to open ourselves to joy, pleasure and compassion, and to respond with love and blessing. Azumar can begin the flow of these qualities within us, and if we give ourselves in full participation, we can enter a future more wonderful than we can imagine. 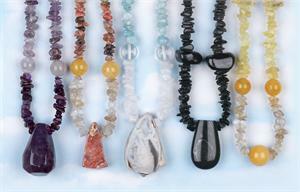 Healerite continued to be a staple for stone, jewelry and bead buyers at our Tucson exhibition in February 2014. Many individuals and business owners who had first purchased Healerite the year before were eager to buy more this year. This stone had truly proven its energy and connection with people in the year since we first introduced it. We are please to expand our Healerite offerings in this catalog! Robert Simmons writes: “This is a stone of profound healing energy, working on multiple levels to restructure misaligned chakras, meridians, and systems in the organic and etheric bodies, bringing a great beneficial infusion of subtle matter-energy. Healerite’s currents move into the body quite readily at any point, carrying emanations of well-being to body and soul. This stone resonates strongly with the heart, solar plexus and third eye chakras, facilitating an elevation and alignment of the vibratory qualities of these three chakras and one’s entire vibrational field. Through the linking of these chakras, Healerite stimulates the harmonious accord of awareness, love and will, empowering one to manifest these more fully than ever before. Those engaged in self-healing or in facilitating the healing of others will find a valuable ally in this wholesome and powerful stone. “Healerite energizes the Liquid Crystal Body Matrix, creating revitalization on the cellular level. Its currents encourage all of the cells and internal systems to harmonize with one another, and with the Divine Blueprint of the holistic perfection of the body. This is a stone to carry or wear for the maintenance of one’s resonance with this pattern, as well as for re-connecting with it if one is ill.
“On the emotional level, Healerite is an excellent ally for encouraging the optimal emotional states of joy, expansiveness, generosity, intimacy and heart-centered awareness. This stone is a great aid for those seeking to heal old wounds to the emotional body--even those carried unconsciously from past lives. It is excellent for facilitating the recollection of past lives, and for learning the lessons which allow one to correct dysfunctional patterns and move forward. Healerite can also help practitioners break the pattern of being the ‘wounded healer’--one who engages in helping others but neglects one’s own self-healing. It is one of the most profoundly wholesome, balancing, energizing stones I have ever encountered, and I feel it can help one bring about amazing shifts into health and wholeness. “For self-healing of the body, I suggest placing Healerite on the afflicted areas, as well as in energy grids around the body. One can also carry or wear the stone to keep its influence in the auric field throughout the day. “On the spiritual level, Healerite is a stone of planetary healing. Planting this stone in areas where damage has been done to the etheric body of the Earth through the traumas of war, pollution, deforestation or environmental exploitation can affect the spiritual repair of such areas. If one does such planting with clear intention and ritual, the effects are much enhanced. “One very important quality of Healerite is its capacity to infuse one’s body--both physical and etheric--with subtle mater-energy from the higher realms. We are now in a period in which a great cascade of Divine blessings are being showered on the Earth, and onto all human beings. However, we must choose to be receptive to these currents of blessing (and willing to pass them on to others), in order for the full flow to enter us. Healerite magnifies this flow and helps one feel it, which allows the intensity and quantity of subtle matter-energy to increase even further. This ever-increasing infusion is the very essence of the accelerated spiritual evolution we are now called to embody. “Healerite’s currents flow into our being through the channels of the energy meridians--the same ones known in acupuncture and other modes of subtle energy medicine. One way to describe its effects is to say it greatly increases one’s chi, or life force. This may be the underlying reason for its multitude of beneficial effects. Healerite can help one calm frayed nerves, balance the body and emotions, attune to the spiritual realms, and increase inner vitality and energy. One can feel years younger when the subtle matter-energy of Healerite fully permeates one’s being. It says to me that it is a stone of longevity and rejuvenation, as well as simple healing. “I recommend wearing Healerite at any and all times, as well as placing pieces in one’s environment. Its wholesome emanations teach one’s body, mind and spirit, on the subliminal level, the patterns of health, inner harmony and spiritual awakening. It can open the mind to higher worlds, and it can open the heart to Divine Love. Treating our Auralite 23 collection to the Azozeo Super-Activation process proved itself to be a very good idea! In our 2014 exhibition in Tucson, energetically sensitive buyers chose it over regular Auralite by a big margin. And of course, we also can feel how much more powerfully Auralite 23 emanates its essential vibrational pattern after the Azozeo treatment. It doesn’t change what the stone does--it just adds power! Robert Simmons writes: “Auralite 23 stimulates higher awareness and telepathic connection with one’s guides and guardian spirits. It offers a direct and immediate link to what is called the ‘Magic Presence’––the Self beyond the everyday ‘I’ that knows one’s life pattern and destiny, and which can help one live one’s life as an expression of one’s true spiritual purpose. 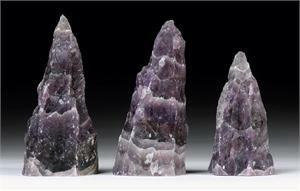 The link Auralite provides to higher realms can instigate a process of inner purification. The felt sense of this can seem like a dissolving of one’s cares and worries and an upliftment of one’s spirit and an awakening to the potentialities for a new life. 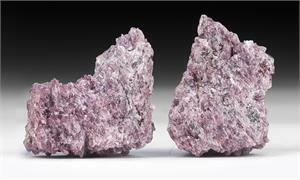 Other effects of Auralite 23 can include an increase of one’s psychic sensitivity, enhanced insight into truth, disappearance of illnesses, awakening of kundalini, awareness of the ‘eternal now,’ visions of future events, enhanced capacity for soul travel and lucid dreaming, and experiences with Angels. On the emotional level, the peace and widened awareness facilitated by Auralite 23 can clear old issues that cripple the emotional body. This stone also helps heal the soul through facilitating remembrance of past lives and stimulating the insight needed to release karmic patterns. We had never had Revelation Stone items in Tucson before, and last February proved to be a great debut for this high-vibration Jasper from New Zealand! Robert Simmons writes: “Revelation Stone was literally that for me--a revelation. In appearance, these stones are like other humble members of the Jasper family, but on the vibrational level they are extraordinary. They have a powerful resonance with the heart, and they stimulate the heart’s capacity to be conscious of the unfolding pattern of the future. It we work with these stones, we can learn to receive and understand the heart’s perceptions (or revelations) of the time stream of the future. “When I held a Revelation Stone in meditation, the first thing I noticed was a sense of being enveloped in a soft cloud of peaceful awareness. As I held the stone to my chest, I felt my heart ‘jump’ and thump, as if in recognition of its affinity with this stone. This gesture of the heart repeated itself a number of times, making me certain it was a response to the stone. “My felt sense, from the time I encountered this stone, is that it facilitates the gift of prescient vision--of seeing the future--so I paid attention to this possibility as I attuned to Revelation Stone for this writing. Immediately I was shown that Revelation Stone indeed stimulates the heart’s awareness of the future time stream, and that it displays that awareness to the mind’s eye as images or visions rather than words. With that insight I was also shown that the future one sees is not a precise, predetermined set of events, but a pattern of possibility--the potential future, or the blueprint for what may happen, depending on human choices. It is something like watching a weather report--one sees the sort of situation that is coming, but not the details of how it will play out. Our free will determines these details. And thank goodness we do not see an exact picture of what will happen--it would leave us no room to make a difference! “Having said that, it is still of great value to experience the future visions presented through working with Revelation Stone. The pictures on sees are readable, in much the same way one can read and decipher the I Ching or Tarot cards. And similar to these oracles, the patterns require interpretation to make practical use of them. However, the divination precipitated by Revelation Stone is completely within oneself, given as a vision or series of visions. “Perhaps it is best to say that Revelation Stone can stimulate one’s innate capacity for prophetic vision, through opening a channel of communication between heart awareness and mental consciousness. It is an excellent tool for anyone who wishes to improve their psychic capacities, and it can augment to abilities of professional or amateur readers, channels or mediums. “Another trait of Revelation Stone is its ability to enhance one’s awareness of communication from the realm of souls who have died. It one wishes to learn to do such communication, meditation with Revelation Stone is highly recommended. “While meditating with Revelation Stone, if one directs one’s attention in another direction, it can facilitate vivid experiences of past life recall. For those working shamanically, Revelation Stone enhances one’s visionary experiences of those realms as well. Even in areas of simple intuition, wearing or carrying one of these stones can stimulate clearer and more frequent insights. These stones seem to help one to bypass linear thinking and experience direct knowledge. “In healing work, I recommend Revelation Stone for instances of amnesia or suppressed memories. It is also potentially beneficial for those wishing to overcome excessive worry or irrational fears of the future. Revelation Stone, in addition to its capacity to awaken vision, is a steady healing influence for the physical and emotional heart, as well as the brain and mind. Many people at the Tucson Show were surprised and impressed by the power and intensity of the vibes coming from our Empowerite pieces. These beautiful and unique pieces of petrified Chert from New Zealand’s South Island carry a vibration that resonates to the fullness of personal power and strength. Robert Simmons writes: “Empowerite was named for the way it makes one feel--full of confidence, strength and personal power. It is a tremendously potent stone for grounding one’s energies in the Earth, and for receiving and storing the Earth’s Life Force currents or chi. Empowerite reconnects one to one’s natural energetic link with the Earth, even though most of us are so cut off from it that we have forgotten that the Earth is our primary source of power. Those who feel disconnected from the Earth--especially Star Children who long for home--will find that Empowerite can completely shift this disorientation and bring the felt sense of Earth as one’s true home. “Empowerite helps one to become fully embodied. Many people have not actually decided--on the soul level--that they want to be in a physical body. Usually, they are not conscious of this reluctance, but it can result in many problems--including spaciness, weakness, being ‘all in one’s head,’ being accident prone, having little physical energy, and even being invaded by negative entities. The grounding influence of Empowerite can work like magic to bring our souls into full embodiment, where we discover that living in a physical body is really great! Once this occurs, many of one’s symptoms can quickly dissolve. “Empowerite is a stone of confidence and courage. It encourages a state of wakeful self-awareness in which one is fully in command of all of one’s faculties and abilities. It dispels hesitation and indecision, enhances will power, inspires courage, stimulates practicality and encourages one to act with resolve in every moment. It is a stone of destiny, since most people fail to fulfill their destiny through hesitation and discouragement. “Empowerite is a stone of commitment, and as such it leads one into the inner state of ‘unconflicted behavior.’ Most of us live in a consciousness of inner conflict--of some degree of self-doubt and second-guessing. It is trained into us, and we are surrounded by it. However, in extraordinary moments we can find ourselves fully committed, and in that state we can do astonishing things. (We have all heard stories of individuals lifting an automobile off of a child, etc.) What allows this is the complete concentration of one’s whole being into a fully committed act. The currents emanated by Empowerite support a state of consciousness in which self-doubt and fear are increasingly erased, and we are more and more able to focus our intention completely. When we do this, we can go completely beyond what we once thought were our absolute limits. “As a healing stone, Empowerite’s influence can strengthen the digestive system and intestines. It vibrationally supports the liver and gall bladder, as well as the hands, feet and shoulders. It is useful in body-building, and for strengthening the muscles and skeleton. It is highly recommended for anyone convalescing after an illness or injury, and for those who wish to put the psychological effects of grief or trauma behind them. “These stones are literally Sweetness and Light!” A Tucson customer told us. “But I mean the sweetness of inner bliss and the Light of the Divine!” he said. That’s how we feel about them too! There is no doubt that the Azozeo Super-Activation process intensified the currents coming from these energetically delicious stones, but it did so without their losing any of the heavenly delicacy. People at the show loved them, just as we do! Robert Simmons writes: “During our New Zealand adventure in April-May of 2012, we were synchronistically led to an area on New Zealand’s South Island which had once been covered with ocean. Here, among tons of other stones and ancient sand, we found a small number of tan and white stones. Upon picking them up, I immediately recognized them to be a new form of Azeztulite. Of course, I could not tell if the stones had carried their vibrations for many years or if they had been recently activated, but my felt sense was the latter. I believe these and the Sauralite Azeztulites from New Zealand to be among the most recently awakened forms of Azeztulite, and also among the most highly evolved. “Honey and Cream Azeztulite emanates currents that fill the body with waves of Light and something I have to call sweetness. It is a highly pleasurable sensation, stimulating one’s higher capacities, filling one with soft, comforting vibrations. These are stones one could easily fall in love with, as they seem to generate love within every cell of the body. They are different from many high-energy stones, which can be powerful and intense. Honey and Cream Azeztulites combine power with love in a way that calls to mind Nature in her most fertile and lovely expressions. This stone is the mineral version of warm waves on a quiet beach, or a garden of lilies, or a rainbow after a spring shower. It kindles Divine Light in one’s cells, in a way that feels gentle, kind and intimate. There is a great deal of power as well, and it builds to higher and higher levels the longer one holds the stone. Yet it is never overwhelming or uncomfortable--it strengthens at just the pace one is ready for. This is one of the reasons I view Honey and Cream Azeztulites as among the most evolved types of Azeztulite. It feels as if the intelligence which guides the expression of these stones is learning to gauge our sensibilities more precisely, so that the newest Azeztulites are the ones most perfectly matched with human energies. “Honey and Cream Azeztulites (and Sauralite Azeztulite crystals) emanate the most feminine currents of all Azeztulites. They feel very nurturing, and they have a soothing quality, even as they bring a great deal of Light into one’s body and consciousness. In particular, I recommend sleeping with the Honey and Cream Azeztulites. While the original White Azeztulite and Satyaloka Clear Azeztulite are probably too intense for most of us to be able to sleep comfortably in their presence, Honey and Cream Azeztulite can waft you on a carpet of sweetness into the realm of dreams. And the dreams one experiences with these stones are often profoundly spiritual. One can travel through the levels of the Cosmic Spheres to the Great Central Sun, feeling successive waves of bliss. (This experience can also occur when one meditates with these stones.) One may meet the angelic beings who are the Azez themselves, or even encounter Sophia, the Soul of the World, in the dream or meditative state. Such experiences are ecstatic in nature, and the pleasurable waves engendered by Honey and Cream Azeztulite can help one attune to the frequencies of ecstasy that are the nature of the highest realms. “Last but not least, I recommend working with Honey and Cream Azeztulite’s to engender the Activity of Blessing. Holding one of the stones over one’s heart, one is recommended to imagine that, with each inhalation, one is receiving a blessing in one’s heart from the stone. (This IS actually what is happening!) With each exhalation, one is to release a blessing from one’s heart to the stone (to its spiritual essence). This is to be repeated indefinitely, and the longer one does this, the stronger will be the current of blessing one experiences. It is easy to move into an ecstatic state doing this meditation. Ultimately, practicing this will teach one how to meet every experience and each perception within a similar state of mutual blessing. If enough people were to do that, we could transform our world. Last Fall, we were thrilled to announce the acquisition of what was certainly New Zealand’s largest and best collection of Sauralite Azeztulite crystals. Now that they’ve all been Azozeo Super-Activated, they are at the top of the energetic ladder, as far as we’re concerned! Robert’s writing office in New Zealand is filled with over a hundred of these beautiful Sauralite clusters, and he says he’s never been in a room that felt this good before! Robert Simmons writes: “In the first several months after Kathy and I moved to our new home in New Zealand, a rare opportunity arose. Readers will remember that one of the powerful things drawing us here was a deep connection to New Zealand’s Azeztulites--both the crystallized Sauralites and the ocean-tumbled Honey and Cream Azeztulites. We felt that these are the most energetically evolved Azeztulites yet discovered, and definitely the sweetest--the most love-laden. We were drawn here to bring forth these stones, as well as other mineral treasures from New Zealand, to the wider world. “Of these, the hardest to acquire are the Sauralite crystal clusters, especially those of high quality. Sauralites are also the ‘cream of the crop’ energetically, and are among the stones I work with most frequently in my own meditations. So I was amazed and delighted when rockhound friends informed us of the opportunity to purchase one of the largest and finest Sauralite collections ever assembled--the personal collection of a man who was probably the oldest crystal-digger in New Zealand. ‘Glenn’ (not his real name) had been a rockhound for over forty years, combing sites at abandoned gold mines, creeks, silver mines, cliffs, beaches and volcanic hills with a relentless enthusiasm. The New Zealand crystals we call Sauralites were his passion, and although the metaphysical qualities of stones were not part of his world-view, it was easy for us to see that he had a deep love connection with Sauralite, and an awareness of their energies on an almost instinctual level. The crystals had a way of calling to him, which may account for his uncanny ability to find them, hidden under mud, moss and roots in the thick bush of wild New Zealand. When we met Glenn two years earlier, he was already over ninety years old, and he proudly showed us his collection, which was displayed in a large array of glass cases in his garage. I remember being astonished at the variety and beauty of his collection, and being almost overwhelmed by the energy in his garage! “Months after we moved into our New Zealand home, we found out that Glenn wanted to sell his collection. He was now ninety-three, his wife had passed away, and he was ill as well. We felt privileged to be the ones who were allowed to buy these crystalline treasures. There were hundreds of amazing pieces, large and small, and each seemed more beautiful than the one before. More importantly, they were bursting with the sweet, loving vibrations of Sauralite Azeztulite. We felt it was our job to honor and accept Glenn’s crystal legacy (which was truly a life’s-work) and to do our part in spreading its blessing around the world. It is unlikely that there will ever be another collection like this one, and we urge our readers to consider, as we do, the fact that what appears on these pages is unique--perhaps even sacred. What we are showing here is not the whole collection. More will be presented over time, both on our website and in future catalogs. But we have not held back the best--this is as good as it gets! “In the Great New Zealand Sauralite Collection, virtually every specimen is unique. Glenn did not keep any run-of-the-mill specimens. 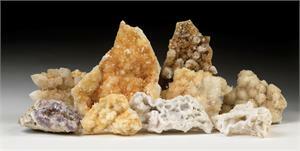 However, there are numerous groups or types of crystals, some having to do with form and shape, others with color. I’ll let the forms (which are evident in the catalog and website photos) speak mostly for themselves and say a few words about colors and their comparative energies. “White Sauralites have already been extensively described in my other articles. However, I can summarize by saying they are the purest and sweetest of all Azeztulites (and perhaps all crystals! ), Awakening the upper chakras from the heart to the crown (and above), and stimulating every cell in the body to become literally en-Lightened. I have inwardly seen that these crystals trigger the DNA in every cell to emanate greater amounts of spiritual Light. Also, they bring about a profound inner purification in which old negative attachments and habits can be dissolved, from the mental and emotional levels all the way down to the cells. 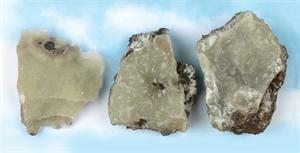 White Sauralites are uniquely tuned to the angelic realms, and particularly to the realm of the Azez, the Azeztulite Angels. It is perhaps this direct connection that makes them such sources of joy. They can take one on meditative journeys that lead to ecstatic rapture and merging with the pure Light of Source. “Golden Sauralite clusters are almost Citrine-colored, and like Citrine, it is iron that makes them look as they do. On the energetic level Golden Sauralites share the sweet, uplifting and transformational qualities of all Azeztulites (and of New Zealand’s Sauralites in particular), plus some other special energies. Golden Sauralites resonate with the Crown, Third Eye, Heart and Solar Plexus chakras, facilitating and enlightened awareness along with a powerful ability to manifest through the will. They are powerful stones of prosperity, and can aid in acquiring wealth, particular if the use of the abundance is for spiritual goals. “Gold-White Sauralites partake of the qualities of both white and Golden Sauralites. They are something of a bridge between the energetic qualities of both stones. In addition, they are uniquely attuned to the Gold-White Ray of the Great Central Sun, and can be powerful aids in making a meditative journey to that wondrous Star. (I have been there once, and it was a life-transforming experience.) Gold-White Sauralites are excellent allies for manifesting one’s spiritual ideals, and help one discover the incredible power of radical receptivity. These stones help one relax the personal will, allowing Divine will to work through the individual self. “Amethyst Sauralites have also been described elsewhere, but by way of summary, I can say that these crystals add an emphasis on purification and protection to Sauralite’s already-powerful energies. They aid one in consciously finding one’s Divine connection to guidance, and they cleanse the auric field of psychic debris. They are probably the ultimate stone for overcoming addictive behaviors and self-destructive habits. The link between Phenacite and Azeztulite goes all the way back to the beginning. Readers of Stones of the New Consciousness may remember that the very first Azeztulite was brought into full activation through the influence of a powerful Phenacite crystal (which the Azez themselves “borrowed” from us!). About two years ago, the Grandmother Phenacite (largest single Phenacite crystal in the world) was found, and it led to our discovering the Azozeo Super-Activation process for Azeztulite, Auralite 23, Lemurian Light Crystals and certain other stones. After this, we began calling the Grandmother Phenacite the Grandmother Azozeo Phenacite. Last February, our hopes for the discovery of more Azozeo Phenacites were manifested, as an array of smaller Phenacites, mostly pocket size or hand size, were found at the original digging site. Then, this past September, our miner friend in Brazil cam up with another Azozeo Phenacite discovery. This time, the crystals were large, including one almost as big as the Grandmother Azozeo Phenacite. This very large Phenacite is being taken to New Zealand, to anchor the Nameless Light energies more deeply into the Southern Hemisphere. The rest of this new group of world-class Phenacite crystals is on display in this catalog, available to be claimed by Lightworkers who also want to participate in world-transformation through the power coming through these exceptional stones. Robert Simmons writes: “What an astounding and exciting discovery this is! When we acquired the Grandmother Azozeo Phenacite, I felt something major had happened in my own life as a crystal worker. Of all the stones I had ever known, this one was the most clearly a Being, a stone ensouled with a presence that was truly angelic and individual. I know this is true of many crystals, but this was a VERY BIG Being, and a HUGELY joyful one! No one could hold her without feeling that presence and that joy. I knew I would always want to keep that crystal near me. “However, I was soon to feel quite torn. When we discovered that the Grandmother Phenacite could bring about the Azozeo Super-Activation process in an apparently unlimited number of Azeztulites and other stones, I felt that it was wrong to take my crystal with me to New Zealand, because the stones needing activation were mostly in Vermont. “We asked for a solution, and both Leo and Kathy felt that we would somehow receive another very large Azozeo Phenacite, which would dispel the problem. This past September, it happened. We now have two Great Azozeo Phenacites, one for each hemisphere. And on top of that (as Spirit so often gives us more than we ask for) there are another NINE Azozeo Phenacite large crystals which were discovered at the same time! This kindles in us the vision of a world-wide distribution of the Great Phenacites of Light and Vision, the Azozeo stones, going out around the world to enhance and deepen the super-activation of ALL THE QUARTZ in the Earth’s crust! I feel that this World Grid can be just about anywhere in terms of location. The main thing is for the stones to be distributed to enough different people--individuals who carry the intention of grounding the Nameless Light--this is my vision of the essential reason for the coming forth of these great stones of power at this time. “In terms of vision, the new large Azozeo Phenacites, as well as their smaller cousins, are among the most powerful stones for initiating visionary experience. Sleeping or meditating with any of them can be an incredibly transformative experience. They are powerful talismans for interdimensional travel, and for linking with angelic intelligences for guidance and spiritual initiation. For those who have read the Lord of the Rings books, I could make the comparison of these crystals to the legendary Palantir and Silmaril stones. The Palantir stones were visionary, allowing individuals to see both far and deep, while the Silmarils were powerful talismans of spiritual Light. These Azozeo Phenacites carry both sets of qualities, and are like a combination of Tolkein’s mythical power stones come to life! As in his story, one is advised to bring a pure and positive intention in order to use these stones for the highest good. “These Phenacites are capable of fully opening the third eye and crown chakras, and they also stimulate consciousness in the Soul Star and the etheric chakras above the head. In addition, they send strong vibrational waves into the heart, greatly enhancing heart awareness and linking the heart and brain. The full awakening of the heart and upper chakras together can bring about the activation of a huge ‘super-chakra,’ which is the unified activation of all the higher energy centers. This is an aspect of Light Body Activation, a process these stones strongly facilitate. One of the truly amazing materials we discovered when we came to New Zealand is the amber-like substance we call Kaurilite. It is a fossilized or semi-fossillized resin of the ancient Kauri tree, native to New Zealand, and among the most majestic trees on Earth. Kauri trees have been in existence for about 150 million years, going far back into the dinosaur age. Their amazing vitality and longevity make them among the most ancient tree species. The trees grow up to over 150 feet tall, with an extravagant crown of branches emanating from the top of their thick, straight trunks. 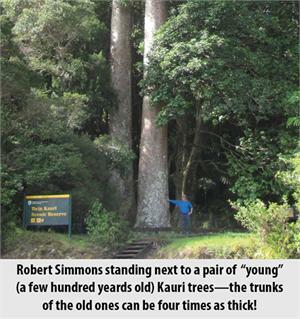 When European settlers arrived in New Zealand there were huge tracts of Kauri forests. The trees could be as much as 2000 years old, and have a trunk circumference of over sixty feet. Many were cut down for lumber and ship’s masts, and by the early 20th century, about 90% of the Kauri forests were gone. Although it is no longer legal to log Kauri trees, certain swamp excavations have led to the discovery of buried Kauri trees up to 50,000 years old--some with their bark and seed cones still intact. These “swamp Kauris” are now used to make beautiful carvings, bowls and furniture. In addition to harvesting the trees, both the native Maoris and the European settlers found numerous uses for Kauri resin, which the Maoris called kapia and the Europeans called Kauri gum. The Maoris used the rich, amber-colored material for fire starting and making torches, as well as for tattooing and for a kind of chewing gum. Europeans discovered that Kauri gum dissolved in linseed oil made excellent varnish, and harvested thousands of tons of it during the nineteenth century. The material has also long been used for making jewelry and carvings. Because of the industrial uses in 19th century Europe, the once-plentiful Kauri resin is now relatively rare. However, it is still used to make a special high-quality varnish for expensive violins. On New Zealand’s North Island, there is now a large museum dedicated to the Kauri tree and Kauri gum. We received our first pieces of Kauri resin (which we now call Kaurilite) as a gift from some Kiwi rockhound friends. They showed us Kaurilite’s trait of exuding a sweet, fresh fragrance when one rubs a piece briskly between one’s fingers. I like to carry a piece in my pocket to rub every so often and get the scent of the ancient Kauri forests of New Zealand. Inhaling the scent is highly refreshing and revitalizing. Kaurilite is often quite beautiful as well, exhibiting translucent tones of gold and brown (ranging from the color of lager beer to old whiskey), and appearing in a myriad of phantasmal shapes. Most Kaurilite is much younger than Amber, ranging from a few thousand to over fifty thousand years old. As a result, Kaurilite is energetically much more active than Amber, feeling as though it is still a living substance. One can work with Kaurilite for its metaphysical benefits, just as one might work with Amber or Jet--both of which are organic compounds that are classified as true “gemstones.” In fact, Kaurilite has unique energetic traits unlike any other substance. Some of these traits are derived directly from the Kauri tree itself, while others are harder to pin down. Robert Simmons writes: “When I attuned to Kaurilite, I was shown that it carries a tremendous amount of life force. Carrying or wearing Kaurilite brings an infusion of prana into one’s auric field and one’s Liquid Crystal Body Matrix. This may be because Kaurilite comes from such hardy and long-lived trees, whose lifestream spans so many millions of years. The Kauri Being is strongly present in Kaurilite, and is naturally friendly to humans (in spite of our history of destroying the trees). Love is simply in the nature of the Kauri Being, as are wisdom, majesty, patience and humor. When one aligns with Kaurilite, one resonates with all of these qualities. “Kaurilite can work metaphysically to enhance one’s physical, mental and emotional vitality. It is a good material for all types of self-healing practices, lending energetic support to the immune system as well as one’s blood and lymph systems. Kauri trees produce natural anti-microbial substances, which may have something to do with Kaurilite’s spiritual capacity to aid one in overcoming microbial invasions and other types of illness. Kaurilite is itself a liquid crystal substance, and perhaps this accounts for its strong healing resonance with our own liquid crystal cells and tissues. “Kaurilite is a purifying substance. Crumbled pieces can be burned like incense to clear an area, to purify one’s aura, or to cleanse crystals and stones. Carrying or wearing Kaurilite can renew one’s energy field and bring a wholesome sense of well-being. Kauris are among the best of all trees for absorbing and transmuting carbon dioxide and replenishing the air we breathe. Kaurilite embodies this power of purification for spiritual applications of all types. Our friends Robert and Cheryl Sardello of The School of Spiritual Psychology have been avid crystal and mineral collectors for several decades, and their collection is truly amazing. Right now, to fund a special project, they have decided to put some of their spectacular pieces up for sale, and we’re helping them. To see what we’re talking about, go to www.HeavenAndEarthJewelry.com and visit The Sardello Collection!